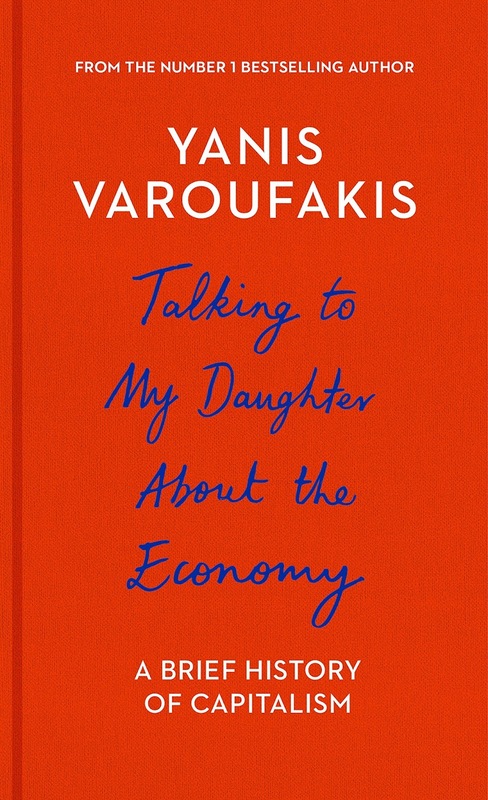 First published six years ago, Varoufakis's book, Talking to My Daughter about the Economy, addressed to his then 12-year-old daughter, is a quick read in economic theory that would benefit from some dates and locations in its lessons to cement examples in history. He was still discussing the text in a podcast last June, so he must still stand by his claims. And it rests on one very important point: "You cannot afford to roll your eyes and switch off the moment words like 'economy' or 'market' are mentioned" (10). We've lost the luxury of ignorance now. We need to all understand how the system works. "Your question, sir, is the equivalent of putting to the British people in 1940 that Winston Churchill's speech, with which he raised the sentiment of the British people against the invaders, was responsible for the suffering of the Londoners after the Blitz or during the Blitz. The shortages, the rations, and so on and so forth. There's no doubt that freedom and rationality sometimes needs to be defended by means of a great deal of suffering. But to turn to the victims and blame them for what the villains have done is the height of audacity." 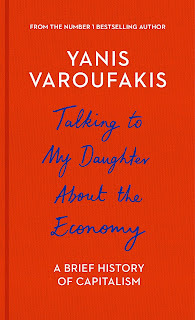 Regardless Varoufakis's role, one critic of his action as Greece's finance minister, the Minister for Finance in Ireland, who expected to hate the book, was surprised to find it "a stimulating and elegant perspective on market economies . . . accessible but not simplistic. . . . I found the section on public debt somewhat poetic. Even if this dimension is not evident to other readers, the lucidity of the explanation will be." But he found the solutions to it all "baffling in its brevity." Why didn't the Aborigines in Australia invade England? Colonizers had bigger and better tools and equipment, so they were better able to invade and take over places, not because they were smarter, but out of sheer necessity. The places colonized largely had a ready food source year round. They didn't have to develop the tools and technology necessary for long distance travel or for killing huge animals. About 10,000 BCE people started cultivating the earth because they had "multiplied in number so rapidly that produce from the trees was insufficient. . . . Where humans could avoid it--as in Australia--they did so " (11). Also, in Eurasia, from West to East, the same crops could be grown and 'banked' whereas Africa has dramatically different climates from one area to the next. The only storable form of agriculture was grains, and their storage created surplus, the basic element of an economy. The first type of money developed in 3,000 BCE Mesopotamia: shells with the amount of grain deposited in a central storage area written on them. Citizens had to trust people controlling the granary. The origin of word 'credit' is from the Latin credere 'to believe' (15). Surplus was necessary to create organized religion (since they don't produce anything to trade) and a government and army. It also allowed for writing, debt, states, technologies.... Inequality between countries is a matter of force and power, but within communities, inequality is created and maintained by the ideology that the haves deserve what they have. 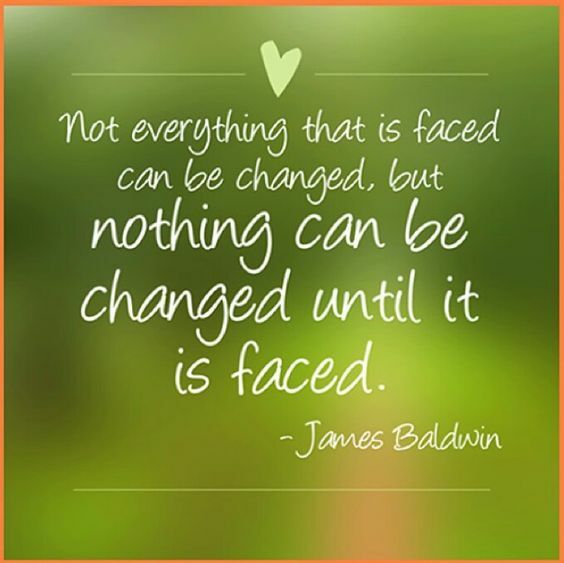 "When our eyes fall on those who lack the bare necessities, we immediately sympathize and express outrage that they do not have enough, but we do not for a moment allow ourselves to think that their deprivation may be a product of the same process that led to our affluence. . . . When you fee as if you're about to give in to the idea that outrageous inequality is somehow unavoidable, remember how it all begins: with babies born naked into a society that segregates those it will dress up in expensive outfits and the others, whom it condemns to hunger, exploitation, and misery" (24-25). He delineates goods (useful things) from commodities (things that are bought and sold). Once we attach a price on a friendly gesture, it shifts from a good to a commodity, and people will do less for money than they will for good will: "where blood donors are paid for the blood they donate, the quantity collected is significantly smaller" (30). The financial transaction ruins the intrinsic pleasure in the act. Then he further delineates things with experiential value from exchange value (e.g. a sunset has experiential value, but no exchange value). Now, after a few centuries in a market society, we tend to see all goods as commodities and try to measure all values, but most goods used to be produced outside the market. We made our own bread, etc. We produced goods and only rarely produced commodities (surplus goods). Now we have patents to makes sure we get every penny for any ideas, and even genes have exchange values. A mother's womb can come under a 'rental agreement' (35). A society with markets changes the behaviours of citizens to become a market society. All production now requires raw materials (capital goods), land where production takes place, and labour, but it used to be the case that land and labour were be born to us rather than bought and sold. Peasants lived on the land they were born on without paying for that right until the 1500s, when sheep became more lucrative in Britain, and peasants were evicted form ancestral lands. It was the precursor to mercantilism. Suddenly, the peasants had to commodify their labour and trade work for the privilege of living on land (i.e. worked to pay rent). Then when factories started running in the mid 1700s, it was a triumph of exchange values over experiential values. One one hand there was new freedoms as slavery decreased and there was hope for a surplus for all, but there were new forms of misery as the landless had to pay rent: "freedom came with new chains . . . entirely at the mercy of the markets" (47). With the invention of the profit motive, "money was transformed from being a means into an end . . . the rise of profit as a major incentive for people to do things came hand in hand with a new role for debt" (49). The financial contract "turns an informal agreement . . . into a legal obligation with specific terms that take the form of exchange values" (52). And interest (formerly seen as the sin of usury) became a mere cost of doing business: "whoever receives the loan (the debtor) will eventually pay the person giving the loan (the creditor) something extra in addition to repayment" (52). The incentive to loan anything is the interest gained. Marlowe's Dr. Faustus was written "when exchange values first began, little by little, to prevail over experiential values . . . the play reflects beautifully the emergence of the profit motive in early modern Europe and the anxiety it caused" (53). It marks the moment when debt partnered with profit. Formerly, the serfs worked the land and produced goods (production), then feudal lords took a share forcibly and sold left over goods (distribution) and had surplus money to loan (debt/credit). BUT the commodification of land created a "Great Reversal" in which, "instead of the distribution of surplus coming after production, distribution began before production had even started" (54) and profit became an end in itself. The landless serfs had to rent land, which forced them to sell goods for profit in order to pay rent, but, in order to get started, they had to borrow form the loads. So their debt came first, then constant work in order to survive, and no means to every pay off the debt. They ended up slaves to their debt obligations even though they were technically free: "new wealth thus grew side by side with burgeoning debt and deepening poverty . . . debt, not coal, was the real fuel that powered the engine of the Industrial Revolution" (56). Redemption comes through repayment of a debt including interest: "The question of debt has been a religious one for a long time" (60). It used to be seen as a sin and legally prohibited, but the industrial revolution could not have happened without debt spurring on people's willingness to work in inhumane conditions. A preemptive, necessary debt load of the masses shifted societies with markets to market societies. If we save money without borrowing or spending, the economy comes to a standstill. Bankers don't loan money from other customer's savings, like George Bailey would have us believe, but bankers actually get the money from thin air: "The bankers' magical power that allows them to create money at the stroke of a pen or the push of a few buttons on a keyboard makes us shudder in horror. . . . it is hard to believe that value can be born from nothing. . . . Since they are not constrained to lend existing exchange value, bankers have every reason to keep conjuring up loans" (69-70). Bankers used to be careful to make sure they'd get the money back with interest, their only way of making money, but two things changed: (1) "in the aftermath of the Industrial Revolution, the economies of market societies grew enormously and the debt needed to fuel them rose massively as a result. . . . (2) bankers found ways to insulate themselves from the fallout if things went wrong" (70). "In return for lending the bank $100 each, five thousand investors would each be given a share in Miriam's $500,000 loan. Why would anyone invest in one of theses shares? Because the bank paid them higher interest than they would have received had they simply deposited that $100 in the bank (but lower, overall, than the amount of interest Miriam had agreed to pay). Thus, the banker recouped the $500,000 immediately and still stood to make a profit when Miriam repaid her loan. And if Miriam were to go bankrupt and renege on her debt obligations, it was the five thousand investors who would lose out" (71). But, "the point comes when the loans they have made are so vast that the economy cannot keep pace and the profits being made are no longer sufficient to repay them" (72). Then it provokes a bank run as people withdraw their money en masse. Since banks don't have the money that people deposited there, they can't pay everyone back, and people recognize it's all an illusion of savings in the bank. The state also borrow money: "Since the nineteenth century, when market societies experienced their first slumps, the state--under pressure from its more powerful citizens--has been forced to intervene . . . by lending money to the banks" (74). The state gets money from central banks, who get their money from nowhere. They just keep track of what numbers they wrote on which cheques. The "magic" quality of loaning huge sums that don't exist goes back to Mesopotamian times where people stored grain and were given shells to indicate the amounts. "What mattered then and what matters now is simply that the numbers on those shells or the figures on those ledgers are believable, that the productivity of the land and the wealth and stability of the state make those promises of grain and currency trustworthy" (77). What's changed more recently is that private bankers can do this as well. It used to be considered loansharking for anyone to ask for interest on a personal loan. Only the government could sanction that kind of a contract. Now your local the grocery store is also a bank. "More often than not, the politicians . . . are elected with the help of large contributions from those same bankers. . . . Courtesy of their magical superpowers, bankers can pay themselves salaries far in excess of those paid by the government . . . This toxic relationship between bankers and the state ensures that bankers have no reason to be cautious. . . . The instability that bankers create in market societies can be reduced, but it can never be entirely eradicated for the simple reason that the economy is fueled by the thing they provide: debt. And so it is the case that the more successful the state is in begetting stability, the safer the conditions are for creating more debt, the more exuberant the bankers are allowed to become--and the greater the instability they cause" (78-79). Debts have to be forgiven for practical reasons - or things shut down, so there was born the concept of limited liability: "The law had to be rewritten so that if a business went bankrupt it was only the property belonging to the business that was lost; the personal savings, home, and belongings of the person who ran it were not confiscated" (80). Back in the 1930s, "while millions were hungry, tons of potatoes were thrown into a river and creates of oranges were sprayed with kerosene" (65). And still it's the case that "if the business is a farm that produces fruit whose price has fallen and as a result its owners now face unpayable debts, they have every incentive to destroy much of their produce--even if others around them are starving--in a bid to create a shortage of fruit that will boost its price" (81). Bankers fight against debt forgiveness, but need it in order for the economy to continue. Bankers tend to be against government in good times, but demand their own debts be forgiven when things are bad. The view they hold is that "wealth is produced individually by heroic individuals" (83), but the wealthy rely on the system of underpaying workers for their value. The only way to make a profit is if people are paid less than the true value of their labour: "private wealth was built and then maintained on the back of state-sponsored violence. . . . the state has always provided the rich with a magnificent insurance policy. And the rich have returned the favor by doing all they can to avoid paying their premiums" (84). The system maintain low taxes on the rich and provides state money from public debt loaned by bankers. The national debt should be seen differently than personal debt. "You might be fooled into thinking that government debt is an awful thing . . . Don't fall for that nonsense. While it is true that too much public debt can cause major headaches, too little is also a problem. . . . Without public debt, market societies can't work. . . . By spending this money on its various projects--buying supplies, paying salaries--the government directly boosts the whole recycling process of the economy from which everyone benefits, including the banks" (86). Bonds are perfect for bankers because they can sell them quickly, and they're seen as stable enough to be used as a commodity. Banks are amplifiers of society:"It massively amplifies wealth creation during the good times and wealth destruction during the bad times, constantly skewing the distribution of power and money" (89). Market societies are plagued by three things. The fact that there is an magic-ness to the creation of money, the labour market, and the money market. The labour market depends on everyone believing collectively that everyone else is working for a goal that will, in the end, benefit themselves. "If a goal can be achieved only collectively, success depends not just on all individuals pulling together but primarily on each individual believing that every other individual will do so" (95). People need to believe they will work in unison in order to work together - the belief makes it so. "This is why the unemployment deniers are wrong: because the labor market is based not just on the exchange value of labor but on people's optimism or pessimism about thee economy as a whole, and so across-the-board wage cuts may well result in no new hiring, or even lay-offs" (99). The money market depend on belief in the ability for the market to predict actions and to resist short-term impulses for its own self-preservation, and for the prices to always stay above costs. We may "no longer chain children to factory looms, but . .. most of us feel chained to our technology" (113). "Step by step workers' labor is squeezed out of the production process as various new technologies . .. are adopted" (116). Costs fall further and competition forces prices to fall, but "profits can only accrue if prices remain above costs. The problem is that three forces lead to prices falling below that level" (117): (1) automation, (2) competition between producers, and (3) robots reduce demand for products. "not just a question of replacing workers with robots, it also involves mechanizing human workers when their wage make them more attractive than robots . . . workers, unlike machines, recycle their wages . . . there will come a point when they are too low to support the sales of the goods they help produce . . . it is in the interests of all market society . . . for workers to resist their own mechanization, for it is this alone that puts the brakes on the profit-destroying process of automation" (121-122). Employers want to replace all their workers, but don't want anyone else to do so. They want to free ride on the chance that they can take advantage of mechanization without be affected by the costs of automation. "The love of money as a possession . . . will be recognized for what it is, a somewhat disgusting morbidity, one of those semi-criminal, semi-pathological propensities which one hands over with a shudder to the specialists in mental disease" (132). He explains a bit on inflation: "what gives value to coins and paper money is the legal obligation to accept them across the realm and the belief that they are and will remain valuable" (143). "Expected fluctuations in the overall quantity of money influences interest rates significantly . . . the cost of borrowed money--interest--depends on expectations of what prices will be, on inflation or deflation" (145). "The economy, unlike nature, is influenced, buffeted, and indeed shaped by what we think of it" (146). "A monetized economy cannot be sustained if everyone knows its end is nigh. Everything relies on trust in its longevity, as the very anticipation of collapse is enough to cause collapse" (147). This is why coins stamped with the rulers, to indicate authenticity and certainty of value. The rich don't like to pay taxes, and the poor can't afford to so either we need deficit-financed state expenditure - public debt - to pay for infrastructure - but politicians don't like that because the people don't like it because they misunderstand public debt as the same as private debt. OR we need to create more money. Governments "quietly instruct the central bank to create more money. BUT that diminishes purchasing power of money - so the rich 'depoliticize' central banks to be independent of government and out of politicians' power" (152). The big question is whether people in power (government or the wealthy or both) should act in the interest of the many or the few. Central banks in most democracies are formally independent, but their decisions still political yet no longer supervised by Congress. They end up more dependent on "the powerful unelected few: the oligarchy and the bankers" (156). Bitcoin has been an attempt to completely depoliticize money - but that has serious problems since any theft is not compensated in any way, and "it is impossible to adjust the total quantity of money in the system in response to a crisis--and this makes a crisis worse, as we have seen" (160). A fixed quantity system provokes a deflationary effect. The clear example of this is after 1929, the government wanted to keep money supply the same, fixed to the Gold Standard, but in 1931 the New Deal provoked decoupling from gold holdings in 1933 and relief finally came. "Having accepted that money is inescapably political, there is only one thing we can do to civilize it: democratize it! Give the power to control it to the people on the basis of one person, one vote. It is the only defensible way we know" (162). "Market societies made their appearance as exchange values were triumphing over experiential values. As we have seen it was a triumph that produced unimaginable wealth and untold misery and led to mass mechanization, exponentially increasing the quantity of products humanity could fabricate, while turning worker and employers alike into the machines' mechanized servants. It accomplished something else too: it put us, as a species, on a collision course with Earth's capacity to maintain life" (167). Pine trees have no exchange value just growing on a hill, and their experiential value is incalculable, but "no matter how many trees burn, no matter how scorched the landscape gets, no matter how many animals meet a terrible fate in the flames, no exchange value is lost" (168). Environmentally, it would be beneficial for the community to agree to limit how much we take from the land, but, politically, "such agreements go against the spirit (and sometimes even the law) of competition" (171), so instead we rob the land blind. He calls this orchestrated stupidity: "This is what befalls us when we assume that the profit motive is a natural human trait: it becomes the guiding force for all we do, despite the fact that it is a relatively recent invention of market societies" (172). Some argue that we will only protect the land if we give resources exchange value: "give all these precious but unpriced natural resources to someone who can be made profitable . . . then they will certainly be looked after" (176), but Varoufakis argues that "The reason the rich and powerful, along with their intellectual and ideological supports, recommend the complete privatization of our environment is not that they are opposed to government; they're just opposed to government interventions that undermine their property rights and threaten to democratize processes that they now control" (179). "Markets do a great job when it comes to managing the supply and distribution of good . . . they are terrible at managing money, labor, and robots. As for the environment, the market solution combines the worst of the market with the drawbacks of state intervention" (181). "The fact that our democracies are imperfect and corrupt doesn't change the fact that democracy remains our only chance to avoid behaving, collectively, like foolish viruses" (183). We need to learn the difference between satisfying desires and authentic happiness, and he raises a point that made up the entirety of Freud's Civilization and its Discontents: "We loathe constraints but at the same time understand that they liberate us, if only by helping us question our own motives" (189). He end with the unpopular assurance that economics is not a science. Economists are "more like philosophers, who will never know the meaning of life for sure, no matter how wisely and rationally they argue. But were we to confess that we are at best worldly philosophers, it is unlikely we would continue to be so handsomely rewarded by the ruling class" (197). Because the way we understand money affects our economic system, and because human beings are notoriously complex, it's impossible to know with certainty what will happen when an economic system is manipulated intentionally, but it might be worth a shot. What an excellent post and summary review. You've been busy. I woke up early this morning here in Nova Scotia and checked ProgBlog to find this, and managed to read it through before even putting the coffee on. It summarizes what I had been taught as basic economics when I learned of the way banks create money essentially out of thin air though it requires seed money to start from depositors/investors, (and the book updates the whole mind game to include automation). Modern banking is the best pyramid scam ever created and it's legal because those who made out like bandits with it made sure governments kept it that way, regardless of consequences to planet or people en masse. It also shows how in only 300 years we have managed to successfully over-utilize the planet's resources and polluted it to a dead end from which there is no escape, and why we cannot stop doing it as a species. Perhaps I should count myself lucky as a nonentity to have enjoyed a tiny sliver of the good life from the point-of-view of a biological unit - I've never starved or been subject to poor working conditions or gone through war. And that is and has not been the usual state of affairs for most humans. It has at least allowed the leisure time to contemplate exactly how the wealthy manipulate the rest of us for their own ends. And to shake one's head at the collective idiocy of it all. Capitalism or socialism or communism as we've birthed them all require banks. Can't get away from usury. Apparently the Irish Minister of Finance who liked the book but bemoaned the lack of a Step-by-Step set of rules to end the mess we're in doesn't really get it. Modern Finance Ministering for Dummies is what he really wants as he presumably expects his bread and also cake along with a good cup of tea to continue without effort, by the mere waving of a magic wand and following Ten Steps To Success, thus not really understanding the basic explanation provided. Full relief is not possible at this stage without major change, and Fraud and Kenney argue against even a minimal carbon tax as if it were the end of life as we know it rather than an attempt to delay the inevitable. I watch complete dolts, usually Conservatives, wandering around repeating the stupid mantra that "the free market solves everything" based on oligarch jingoism promulgated by newspapers owned by the rich, and not historical fact. Further gerrymandering of public opinion by the wealthy following along after the Ayn Rand school of non-thought has been the trickle-down theory and privatization which collectively have not prevented the wealthy from hoarding money in tax havens. Doug Fraud and that deep thinker Kenney out west still repeat this BS. The Western populace gobbling up the world's resources with abandon as directed, expends its entire native wit on social media occupying its collective mind with SFA of any consequence such as publishing a selfie of breakfast pancakes with organic blueberry sauce - Descartes would have been highly amused. It's Avoidance of Consequence writ large, so one has to question whether attempting to save our species which has ruined the world completely since the last ice age is worth it or not. I don't think; therefore I am not. Take a breath, then take a look. Check out my chapter on Sartre's existentialism in Louis' stand-up. Follow me to get notifications of my sporadic posting! Saturday Photo: The Beauty of Natural Easter Eggs, or an Ethical Contradiction? Can You Imagine Canadians Doing This? April 18: We are gpverned by the greediest and most immoral of humans. We’re hiring! Assistant Principal needed at TNA. Spring is on its way....I hope!